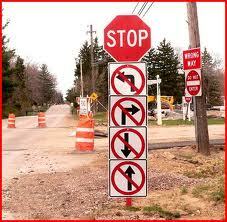 Have you ever come across a traffic sign which left you completely baffled? 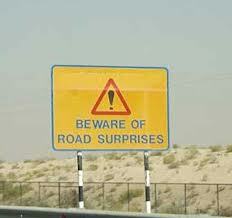 If you haven’t then you clearly haven’t been on any of the roads which display some of these weird signs. Eh? Are you you meant to slow down to 5 mph in order to read all of this sign? 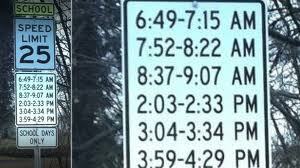 Why on Earth would they be so weirdly specific with the times the speed limits are to be applied? Wouldn’t it have made more sense to just apply the 25mph speed limit from 6.45am – 9.15 am and then again from 2pm – 4-30pm? I would imagine that there would be more accidents caused by a weird traffic sign like this than stopped by the lower speed limit which is briefly in place a few times an hour. So let’s get this straight; you need to stop here.Then you can’t go right, you can’t go left, you can’t go forwards and you can’t go backwards. Hmm, is this one of those riddles in which the answer involves asking one of the dwarves what his twin brother would have answered if I had asked him which route to take? If you are ever in this part of the world then having a packed lunch in the car and an infinte supply of patience will come in handy.